The story and history of Saint Peter of Alexandria. 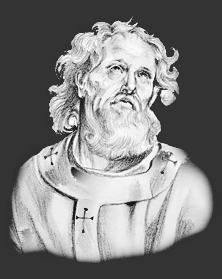 Saint Peter governed the Church of Alexandria during the persecution of Diocletian. The sentence of excommunication that he was the first to pronounce against the schismatics, Melitius and Arius, and which, despite the united efforts of powerful partisans, he strenuously upheld, proves that he possessed as much sagacity as zeal and firmness. But his most constant care was employed in guarding his flocks from the dangers arising out of persecution. He never ceased repeating to them that, in order not to fear death, it was needful to begin by dying to self, renouncing our will, and detaching ourselves from all things. St. Peter gave an example of such detachment by undergoing martyrdom in the year 311. The Feast Day of Saint Peter of Alexandria is November 26. The origin of Feast Days: most saints have specially designated feast days and are associated with a specific day of the year and these are referred to as the saint's feast day. The feast days first arose from the very early Christian custom of the annual commemoration of martyrs on the dates of their deaths at the same time celebrating their birth into heaven.